Update: Leslie Underwood filed a lawsuit at the Circuit Court of Pulaksi County earlier this month, and she requested the winnings be frozen until a judge can figure out the case, according to the Daily News. A waitress is claiming that her co-worker at a burger restaurant ran off with a $300,000 lottery ticket that was intended to be split between the two. Leslie Underwood and Mandy Vanhouten, who both work at Sportsmans Drive-In in Arkansas, were given tickets by their boss, who is named Lucky. “It was kind of like somebody died for somebody to tell you that they don’t think you deserve it and their decision has been made,” said Underwood. “She handed me five and she had five,” Underwood said of Vanhouten, according to Arkansas Matters. The two scratched off their pile together at the bar, she said. She and Underwood were going to claim the winnings by New Year’s Day. But then her co-worker allegedly ran off with it. On Wednesday, Dec. 27, Vanhouten appeared holding the lottery ticket for the Arkansas Scholarship Lottery. 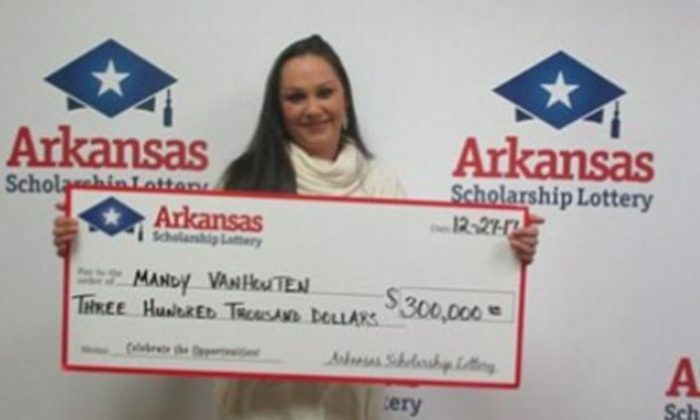 Vanhouten said that she plans to use the prize “to make her life easier,” according to Arkansas Online. In October, a Canadian couple reportedly agreed to share their earnings if they ever won the lottery. Thiebeault then told her that a Lotto 6/49 ticket was not a winner before he moved out of their home. Later, Thiebeault attempted to claim a $6.1 million winning ticket from Sept. 20, about five days after he moved out, CTV reported. On Oct. 13, the Ontario Lottery and Gaming Corporation froze the funds. According to a letter sent by the Ontario Lottery and Gaming Corporation, Thiebeault was awarded half the funds, but the remaining half will still be disputed in court, CBC news reported.